Dakshina Raya is a deity worshipped in parts of West Bengal and Bangladesh. 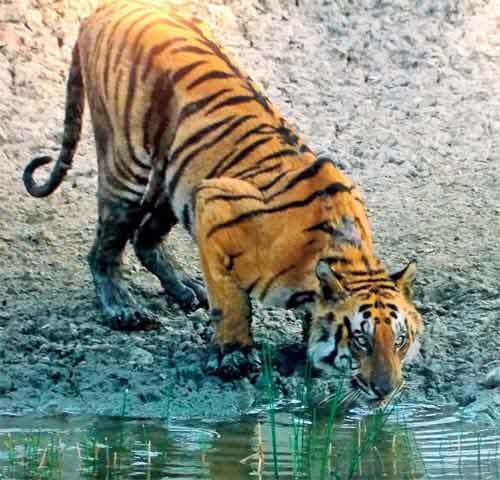 Daksina Raya protects devotees from the attacks of tigers. The deity is worshipped mainly in the forests of Sunderban and 24 Parganas district in Southern West Bengal. Dakshina Raya is a handsome warrior. He carries a bow and arrow and a quiver and shield on his back. Later images of Dakshina Raya have him holding a gun. He is depicted as riding a horse or tiger. He wears a crown and other ornaments. Dakshinaraya is not mentioned in Vedas or Puranas but He has been worshipped by Hindus from the medieval period. Important rituals and pujas dedicated to Daksina Raya are held in the Magh month (January – February). The human form of the deity is rarely worshipped. Instead Daksina Raya is represented by Badha – a metal pot symbolizing the deity. The metal pot is hung from trees in forest. Those who venture into the forest offer prayers at any time of the day for protection and safe return. He is also worshipped as Khetrapal – the tiller of soil. Thus the deity is also associated with agriculture. Some scholars are of the view that Dakshina Raya was a benign landlord or warrior who was later deified.